This example demonstrates how to set and query your IP camera name and location in C#. To implement this example, you need to have OZEKI Camera SDK installed, and a reference to OzekiSDK.dll should be added to your Visual Studio project. 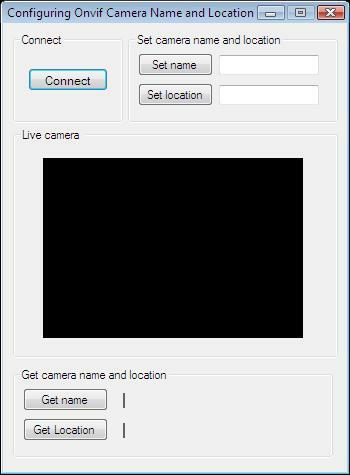 How to set/query the camera name and location using C#? To establish the connection properly between your application and an IP camera you should apply the same code snippet you have used in the example (How to connect to an IP camera device using C#?). Important: you should study this article in order to find out how to set up your Windows Forms/WPF Application correctly. After the successful implementation of the functions and the GUI elements, the application will work properly. Pressing the connect button will load the image of the IP camera device connected to your PC into the panel you can see on the picture. You can set the value of the textboxes responsible for storing the name and location by clicking to the "Set name" and "Set location" buttons. With the "Get name" and "Get Location" buttons, you are able to query the name and location of your camera into the labels you can see below. After the successful implementation of the functions and the GUI elements, the application will work properly. Pressing the connect button will load in the image of the IP camera device connected to your PC into the panel that you can see on the picture. You can set the textboxes' values as the name and location by clicking "Set name" and "Set location" buttons. With the "Get name" and "Get Location" buttons, you are able to query the name and location of your camera into the labels you can see below.